It’s an early Tuesday morning at True Worth Place and people are lining up to check in at the front desk. Scents of breakfast pour out of the kitchen where bustling cooks are preparing hundreds of meals for the day. Upstairs, materials are arranged for the day’s appointments while nurses and dentists prepare for patients on the other side of the building. Designed with the warmth of a hospitality project, it’s easy to forget that True Worth Place is a resource center for the homeless. This is the atmosphere that greets guests and staff 365 days a year. 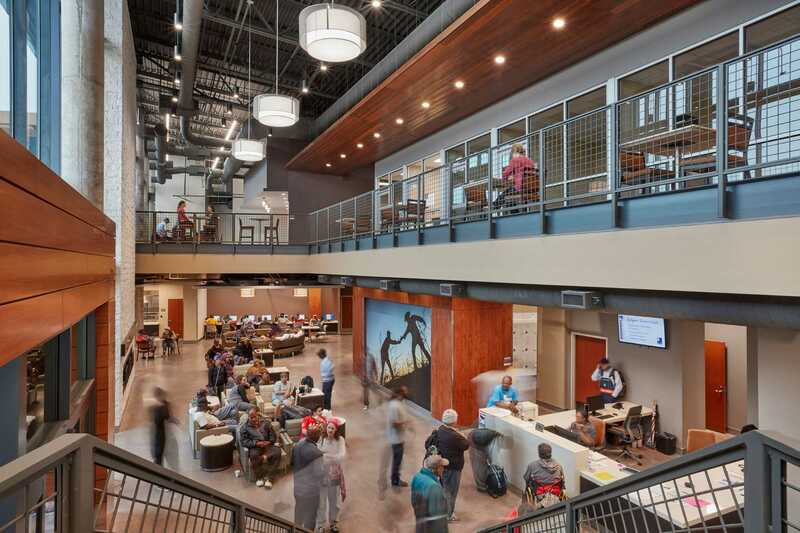 Dedicated to the homeless, the vulnerable and the underserved of Fort Worth, Texas, this HKS-designed resource center served nearly 5,000 people in 2017. That’s nearly all the people who experienced homelessness in Tarrant County during True Worth’s first year of operation. The motto of True Worth and its staff is to offer a hand up and not a hand out. In practice, it’s a strategy that is having a big impact on the people they serve. “We had a homeless couple in tears because [True Worth Place] gave them a sense of dignity,” said Jamie Castillo, HKS’ interior designer for the project. 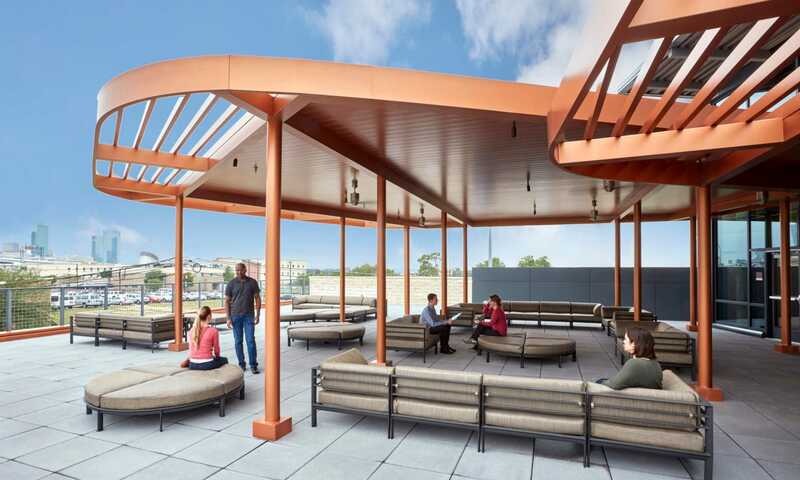 A one-stop-shop, this facility provides more than respite during the day. True Worth provides basic healthcare, therapy and a path toward reintegration with society, including help with job placement, housing and more. Owned by the Presbyterian Night Shelter (PNS) and jointly operated with the John Peter Smith (JPS) Health Network, True Worth embodies its mission of empowering the disenfranchised and restoring hope. Industrial design heavily influenced the design of the building and is clearly visible in the exposed structural details and heavy use of concrete and steel that help True Worth stand out from its surroundings. It was important for the building to be grounded and welcoming, neither clinical nor institutional. The main areas of True Worth are predominantly lit by natural lighting and are detailed with wood tones that create a warm and open environment. The large day room accommodates up to 300 people, which comes in handy when nearly 200 meals are served Monday through Friday at both breakfast and lunch, made by volunteer cooks in an industrial grade kitchen. In the winter, True Worth provides shelter from the cold to hundreds and when the summer heat beats down it becomes a refuge for the sun soaked. Transparency between guests and staff was a leading design influence. Open spaces, plentiful windows and vaulted ceilings provide security to both visitors and employees. 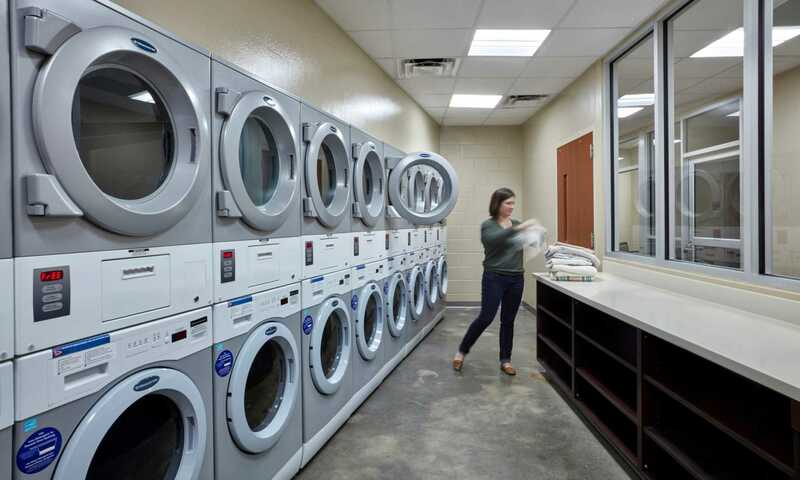 From the director’s office to the mailroom, laundry room and storage lockers, occupants can relax knowing that they are in a safe and visible space. 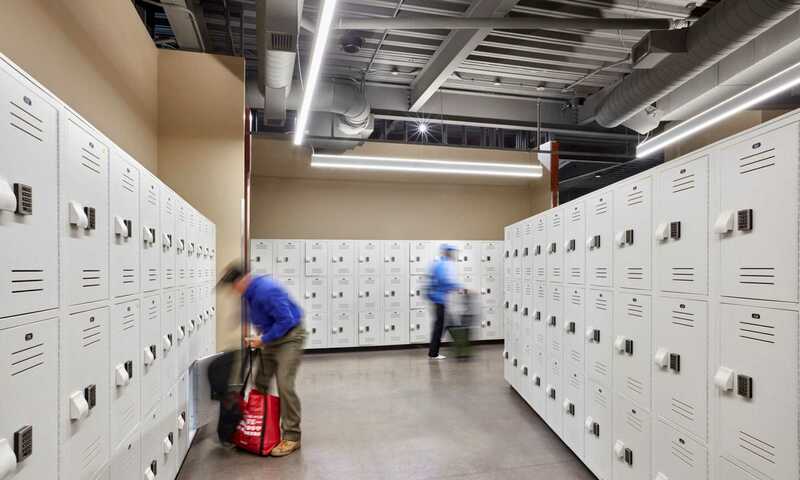 The on-site storage lockers were carefully researched and tested before installation. The final design was selected for storage capacity, security and appearance. The lockers wouldn’t look out of place in a spa and they allow guests to safely stow their belongings during job interviews and other errands. Showers and laundry facilities are also available to guests, whether they’re seeking a job that day or just preserving their dignity. Many of the facilities at True Worth facilitate lessons in life skills that give people a better chance at staying off the street once they’re in a home of their own. A demonstration kitchen teaches cooking and cleaning. Two classrooms are used to teach interview skills, hold resume workshops and much more. Monitors above the front desk display schedules for daily classes. A mailroom operated by volunteers is available to guests as well. This allows the homeless to give potential employers, healthcare providers, friends and family a temporary address until they’re back on their feet. A technology center provides free computer and internet access, empowering guests in their search for jobs while providing a connection to the world. Cell phones and other electronics can be charged at outlets located throughout the facility. A 12,000 square foot clinic operated by JPS occupies the eastern wing of the building. The clinic is equipped with a lab, dental and radiology suites, exam rooms and a procedure room. The building is designed to accommodate a pharmacy should JPS decide to add one in the future. Lessons incorporated from HKS Fort Worth’s deep healthcare portfolio mean that the clinic can handle up to 140 patients a day with a relatively small but passionate staff. While True Worth Place is not an overnight facility, guests are able to reserve a bed for the night at a PNS facility located across the street. Additional neighborhood services include a veteran’s assistance organization, a men’s and women’s shelter and a conveniently located bus stop, which provides access to the city’s public transit network. True Worth provides shelter to some of Fort Worth’s most vulnerable individuals, including people outside of the homeless population. In addition to the physical challenges of being homeless, there are many associated mental issues. True Worth’s clinic provides mental health counseling, access to social workers, and rehabilitation and behavioral-health services. A year after opening, word of True Worth’s impact has spread beyond the DFW metroplex. Leaders from both public and private institutions across the nation are visiting Fort Worth to study the design and operation of True Worth, with the aim of taking lessons home to their communities. In March alone, staff at True Worth were able to secure housing for 28 people while helping six avoid homelessness altogether. Although it’s a small fraction of the nation’s homeless crisis, True Worth Place is clearing a path for other facilities which together will effect real change in homeless intervention. Norman has more than 30 years of experience with health facilities, including designing and planning laboratories for major research facilities, regional medical centers, community hospitals and ambulatory care facilities.